Have you ever been to Perm, the first city of Europe (as many locals like to call it!)? Have you ever enjoyed the beauty of the ancient Ural Mountains? A city of almost 1,000,000 “souls“, (similar in size to Birmingham UK), is situated on the east bank of the Kama river with the Ural Mountains about three-hour drive further to the east, Perm is often described as an industrial centre, but do not be deterred from visiting as this description does not paint a true picture of the city or of what is a very beautiful and largely unspoiled area of central Russia. It is a vibrant city, a city of much diversity, a city where all tastes are catered for, whether you like outdoor pursuits or you prefer something more cultural Perm has something for everyone. Grand Tour "Ural Ring Lite"
Shortened variant of "Ural Ring Maximum" tour. A more detailed exploration of the city includes the display of the city's major attractions (the Kama river embankment and the place of Perm foundation, so called «Stalinist-style» palaces named after Lenin and Sverdlov, churches; Sibirskaya street and the monastery. This tour can be adjusted to suit individual customer needs, such as a visit to an art gallery, the Museum of Modern Art, etc. A new and thrilling experience with access to Soviet secrets! 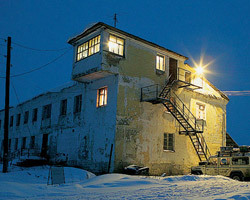 The Gulag Museum at Perm-36 is dedicated to promoting democratic values and civil consciousness in contemporary Russian society through the preservation of the last Soviet political camp as a vivid reminder of repression and an important historical and cultural monument. First big Evrasia Travel international project. Top Choice Adventure in Perm! Evrasia Travel offers various programs at affordable prices. Being the oldest non-state tourist firm in the region, founded in 1988, Evrasia always uses its experience in providing the tourists with high quality services. Evrasia Travel has its own transport, apartments for tourists’ accommodation, own tourist equipment, representatives in Moscow. All the tours are leaded by experienced guides and interpreters that is a guarantee of a high level of quality and safety.